On Sparkpeople we do various Challenges and I joined in the July Stash Buster Challenge, I wanted to knit a cardigan that was made in one piece as I dislike picking up lots of stitches for the front bands. Now for me this was a real challenge as I have never knitted a garment in one piece before and not used markers or short rows. Then there was the grafting of the sleeve seams to master as well so a challenge all round. I am quite pleased with it, I need to get the buttons for it so closed it with a shawl pin for the moment to take a picture of it. It is not blocked yet but still does not look too bad. It is knitted sideways so I had no idea what I was doing I just followed the instructions in the pattern an after a while I could see what I was doing. That made sense and as I worked on the technique I soon found it was not as difficult as I had thought. So now I have learnt to use markers something I had not done before and it has opened up a lot more patterns that I could try as well. Knitting short rows is easy and again it means I will be able to do more patterns that call for short rows and not be put off by it. Grafting garter stitch was the one thing I was dreading but again after seeing it done I was able to do it myself. 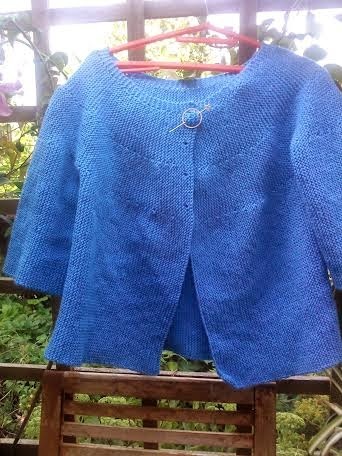 It is not the usual style of cardigan that I go for as I tend to go for longer ones and knitted in the traditional way that means a lot of sewing. This pattern was easy to use and the instructions nice and clear. As it is knitted entirely in Garter stitch it was a nice easy project to do whilst watching TV, no fiddly reversing rows for the right or left side or sleeves, that always get me in a muddle and I have to be extra careful or I make a mess of things. Now that I have tried this pattern I will have a look at other cardigan patterns that are also knitted in one piece. I may end up with a couple of cardigans that will serve me well for early Spring and Autumn and even in the Winter months that I will have made myself. You might be interested in the following pattern from Ravelry http://www.ravelry.com/patterns/library/mochi-plus-2-way-vest It is not quite one piece but I don't think there is any sewing involved. Thank you I will take a look at that later I have added it to my favourites on Ravelry so I do not lose it.